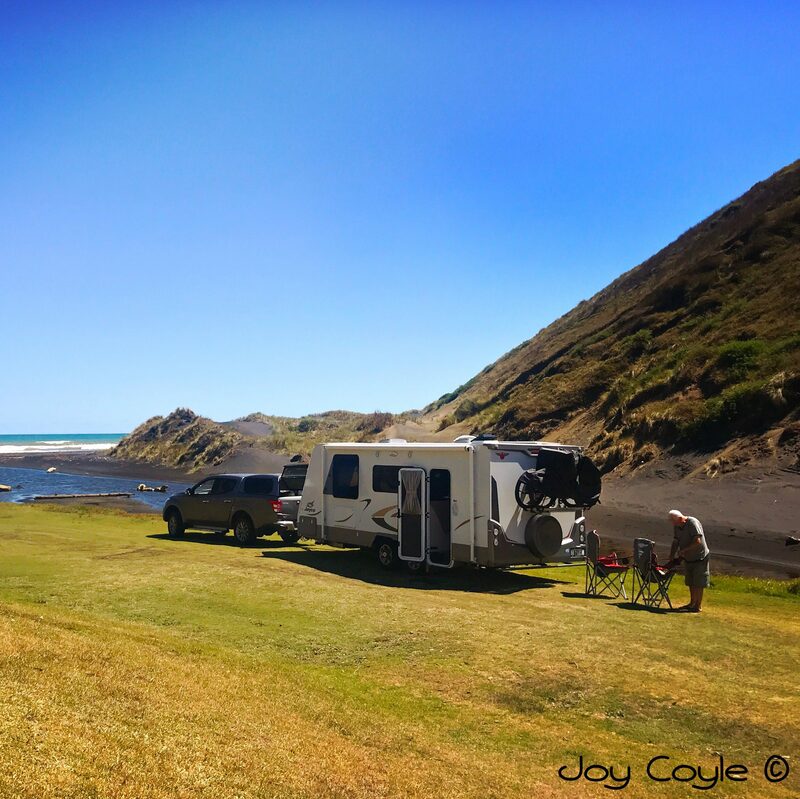 Still in Taranaki, one of the things I was keen to do this visit was to check out the South Taranaki beaches of my childhood – Ohawe, Kaupokonui, and Opunake. The South Taranaki coastline is rugged. This is part of ‘Surf Highway 45’ which sweeps south around the coastline from New Plymouth to Hawera, offering epic surf and empty black sand beaches. Ohawe is just out of Hawera heading around the mountain. South Taranaki’s coastline features marine terraces that stretch from Ohawe all the way south to Whanganui. These have created spectacularly high cliffs with soft papa rock forming the lower part, which is a significant feature of them. Check it out below (enlarge photo for detail). These have been uplifted from the sea over the past three million years, according to an information board at Ohawe Beach. At low tide you can walk along the foreshore from Ohawe to Waihi Beach at the end of Denby Road in Hawera. It’s a 5 km walk one way, or 10 both ways, taking about two and a half hours return. There are spectacular views, coastal reefs, rock pools, and interesting rock formations. Just turn left at the end of the boat ramp and walk along the beach. The Waingongoro River flows out to sea at Ohawe Beach, and the first Māori settlers in Taranaki lived in small undefended settlements here. The remains of moa (large extinct bird) have apparently been found in cooking ovens around the edge of the present day camping ground. Much later, in the 1940s, a strongly fortified Pa stood on an isolated hill within the last seaward bend of the river, where the car park is now located. Both the Pa and the hill have since been demolished by quarrying. Interestingly, it seems large rocks have always been a feature at Ohawe Beach. These old family photographs were taken here in the early 1920s. They show my mother, her mother and aunt, her siblings and cousins enjoying a day out at Ohawe beach. Beach attire has certainly changed though! Taking Surf Highway 45 around the mountain, Kaupokonui is not far from Manaia where I lived as a child, so it was our go-to beach. We always swam in the river. Never the ocean as it wasn’t considered safe. The surf has always been big around these parts. In those days we had to cross a swing bridge to swim, or get to the sand hills and beyond. That was fun. Our brothers and cousins loved to see how far they could make it swing. These days a much sturdier bridge spans the river. This has always been a popular white-baiting (whitebait – inanga – immature fish) river, but now is not the season so there are no nets today. The sand hills seem to have eroded since my childhood (or is it just my childhood memory playing tricks), and large quantities of driftwood line the bank. As I reach the river mouth and look along the coast I’m reminded of the time, I guess it would have been in the 1950s, when a beached whale died, and many people came to see it. It must have been a less common occurrence back then (or maybe it’s because we didn’t have social media), as it caused quite a stir among the locals. I’m pleased all the little baches (holiday homes) are still here. They’ve been an integral part of ‘Kaupok’ for a long, long time. I remember all the family picnics we had here. Now there is a camping ground and a store. These days that hill is tarsealed. I have memories of screaming down a gravel road on my bike, and just making it around the bend at the bottom, thankfully, as straight ahead was a boxthorn hedge! Taranaki is famous for boxthorn hedges. They are used to divide the farms into paddocks, instead of more traditional fences. Their thorns are lethal, but in the very old days, jams and jellies were made from the orange berries. I was reminded of this with an exhibit in Nigel Ogle’s Tawhiti Museum. Happy days, and many happy memories. Before we reached Opunake we stopped at Pihama Lavender which we discovered after a recommendation by a couple from Australia who’d stayed here. It’s found in the old Pihama Cheese Factory on SH45 just before you reach Opunake. It’s a lifestyle and passion for Liz who owns it. She harvests and distils the lavender oil that is then used for many products and beautiful things. There’s a gallery chock full of beautiful work by all kinds of Taranaki artists. And a fresh water stream flows through the property where a resident eel called Neil resides, whom we were lucky enough to meet after Liz splashed the surface of the water to attract him. It’s a delightful place, idyllic really. Another place our family picnicked at every summer is roughly half way around the mountain. Opunake beach is a stone’s throw from the small town of the same name on Surf Highway 45. We’re heading to Cape Egmont for the night, but that’ll be in my next post.